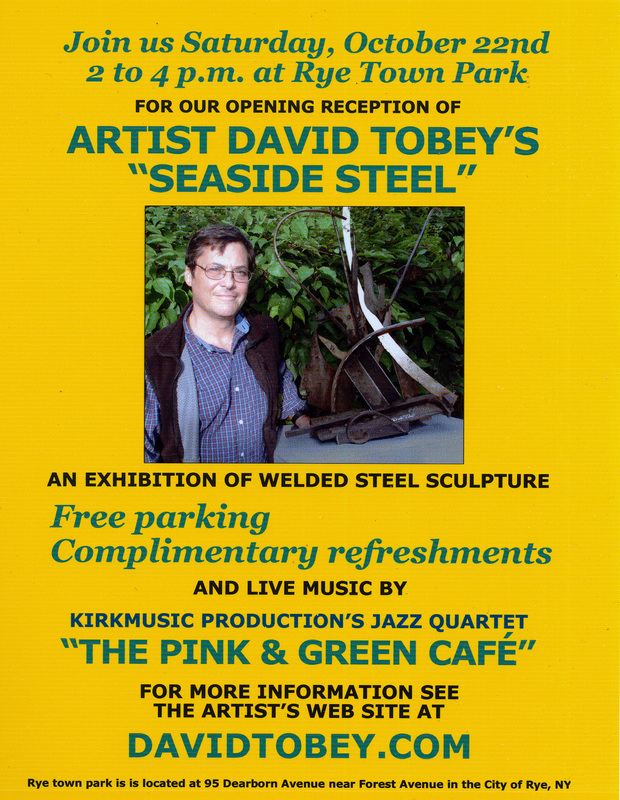 On Saturday, October 22, from 2 to 4 p.m., Rye Town Park in Rye New York is hosting an opening reception for an exhibition of welded steel sculpture by artist David Tobey entitled "Seaside Steel" installed around the park's pond. There will be complimentary refreshments and live music by KirkMusic Production's jazz quartet "The Pink and Green Cafe" at the event. Admission and parking are free of charge, and the public is cordially invited to attend. The exhibition will run through November 19 at the park. Rye Town Park in Rye, NY is hosting an exhibit entitled “Seaside Steel” of some of Westchester artist David Tobey’s recent sculptures from October 22nd through November 19th. The exhibit will open with a public reception from 2 to 4 p.m. on Saturday, October 22nd. The reception will be held at the south end of the Park’s pond, where the exhibit will be installed. There will be live musical entertainment by Westchester's KirkMusic Production's jazz quartet "The Pink and Green Café", and complimentary refreshments at the opening, as well as free parking for visitors. Everyone is cordially invited to attend. A portion of proceeds from sales will go to The Friends of Rye Town Park. The parking entrance to Rye Town Park is located at 95 Dearborn Avenue, near its intersection with Forest Avenue, in the City of Rye. The sixty-two acre preserve on Long Island Sound has 28 acres of lawns and paths and 34 acres of beachfront for swimming during the summer. Sculptor David Tobey has had a life-long career as a visual artist. His father was the noted historical muralist and illustrator Alton S. Tobey. He also is a professional musician and a Juilliard School graduate. He regularly performs on violin with the Westchester Philharmonic and other musical groups. In addition, he teaches music in two New Rochelle middle schools and holds private lessons. In the past ten years, Tobey has had over two dozen exhibitions of his work, mainly in Westchester and in Chelsea galleries in New York as well as at other venues in the tri-state area. His welded steel sculptures are currently on display at three other venues in the county: Washington Square Gallery in Rye Brook; James, a gift shop in Bedford; and at the Katonah Museum store in Katonah. And Gallery and Studio magazine described Tobey’s sculpture as having " . . .a unique draftsmanly fluidity in metal, surpassing even that of [Julio] Gonzalez". This is the fourth sculpture exhibit in the park since the “Art In The Park” program was started in 2008. More information on David Tobey, his work and about this exhibition can be found on his web site at http://www.davidtobey.com; and David can be contacted at (914) 632-8226 or email david(at)davidtobey(dot)com. For more information about Rye Town Park see: http://townofryeny.com/ryetown/RTP_About%20the%20Park.php. Or contact Bill Lawyer at (914) 967-0965 or (914) 939-3075. KirkMusic Productions provides live music and DJ services for all types of events throughout the tri-state area. Samples can be found on their website at http://KirkMusicProductions.com/livemusic.html.